Crystal Structure Refinement is a mixture of textbook and tutorial. 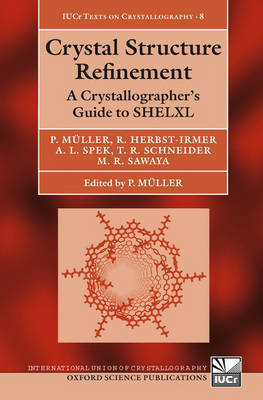 As A Crystallographers Guide to SHELXL it covers advanced aspects of practical crystal structure refinement, which have not been much addressed by textbooks so far. After an introduction to SHELXL in the first chapter, a brief survey of crystal structure refinement is provided. Chapters three and higher address the various aspects of structure refinement, from the treatment of hydrogen atoms to the assignment of atom types, to disorder, to non-crystallographic symmetry and twinning. One chapter is dedicated to the refinement of macromolecular structures and two short chapters deal with structure validation (one for small molecule structures and one for macromolecules). In each of the chapters the book gives refinement examples, based on the program SHELXL, describing every problem in detail. It comes with a CD-ROM with all files necessary to reproduce the refinements.